A black and white large format negative of the Bye baby taken on December 6, 1946. In this view the baby is sitting on a chair draped in a white sheet. She is smiling and looking towards the photographer with her arm on the arm of the chair. 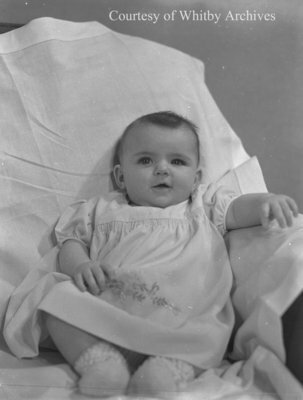 Bye Baby, December 6, 1946, Marjorie Ruddy. Whitby Archives A2013_040_597.